We are excited to announce that Norwood Bank’s new and improved website is now live. 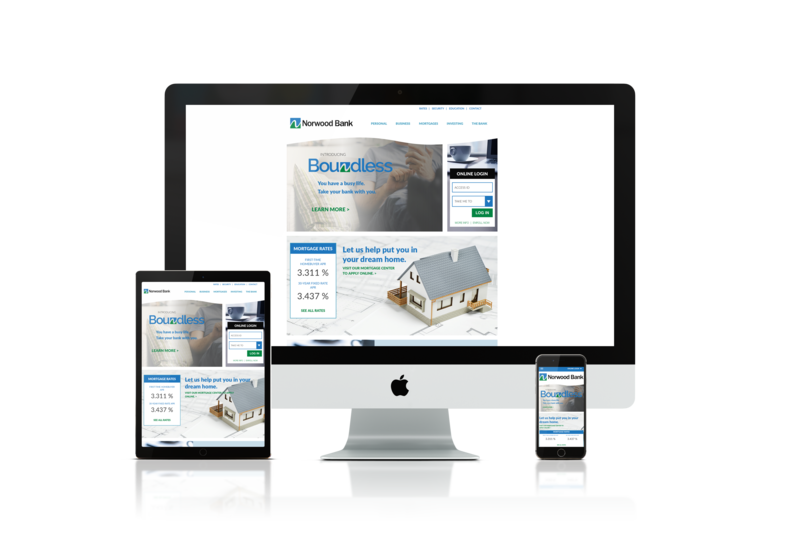 As a technology-forward bank focused on their customer’s banking experience, Norwood Bank wanted their new website to be reflective of this brand promise, and built on responsive design platform in order to ensure an optimal mobile banking user experience across all desktops, laptops and mobile devices. From the discovery process, we found out that Norwood Bank’s customers wanted easy access to their login page, seamless site navigation and quick access to current rates and general bank information. To meet these requirements, improved navigation and the updated site content that supports new products and services became the main focus of this redesign. The website launch was a huge success for Norwood Bank and was well received by all customer segments. We hope you like the changes, and if you have any feedback, please let us know on Facebook or Twitter.